Champ Bailey lunges in front of Troy Brown for a third-quarter interception in the AFC divisional playoff. Bailey sprinted 100 yards before being knocked out of bounds at the New England 1-yard line. The Broncos defeat the Patriots 27-13 in an AFC Divisional Playoff Game to mark the club’s first postseason victory at INVESCO Field at Mile High and propel the team to the AFC Championship Game. The win, which was Denver’s first in the postseason since defeating Atlanta to capture Super Bowl XXXIII on Jan. 31, 1999, ended the Patriots’ NFL-record 10-game postseason winning streak and halted the title hopes of the two-time defending Super Bowl champions. Kicker Jason Elam becomes Denver’s all-time postseason leader in points and field goals against the Patriots. In addition, the win gave Head Coach Mike Shanahan more postseason victories (8) than any coach in Broncos history. 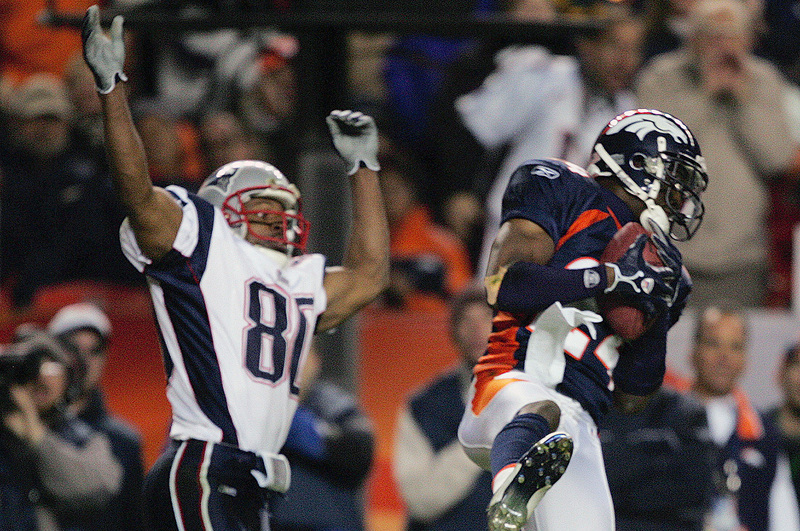 Champ Bailey’s 100-yard interception return in the third quarter punctuated the win. Bailey turned the game by stepping in front of a Tom Brady pass, picking it up and dashing up the west sideline. With every step Bailey took, the crowd roared louder — especially toward the end, when Bailey was running out of gas and laboring as the yards flew below his feet. At the goal line, Patriots tight end Ben Watson sent him flying out of bounds. The ball flew out of Bailey’s hand, leading the Patriots to protest that he had fumbled the football out of the end zone for a touchback. But the challenge failed and the call stood — not that Bailey noticed. “I was on the ground because I was gassed. I couldn’t even get up and walk,” he said. Fortunately for the Broncos, Mike Anderson finished the job, running around the left side for a touchdown. The 14-point swing powered the Broncos to a 27-13 win. For the first time since the Elway era, the Broncos were postseason winners. Bailey got the game ball. But the joy wouldn’t last long.